The R&S®FS-Z60 / R&S®FS-Z75 / R&S®FS-Z90 / R&S®FS-Z110 / R&S®FS-Z140 / R&S®FS-Z170 / R&S®FS-Z220 / R&S®FS-Z325 / R&S®FS-Z500 harmonic mixers extend the frequency range of Rohde & Schwarz analyzers up to 500 GHz. Due to their double-diode design, the mixers are operated without any additional biasing. No frequency dependent adjustment of bias current is needed – an invaluable feature for automated measurements. The frequency dependent conversion loss is calibrated over the entire frequency range. The large number of frequency points included in the resulting conversion loss table provides high level accuracy during measurements. The conversion loss table comes in file format with each mixer and can be loaded directly into the analyzer, which makes mixer configuration very easy. All analyzer models offering the LO/IF ports for external mixers support the harmonic mixers (B21 option required). 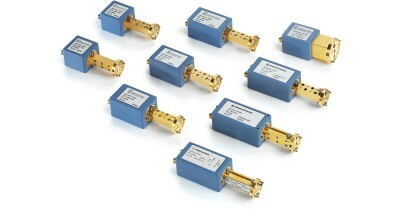 The low conversion loss yields high sensitivity, which is the basis for measuring signals even at very low levels. With a high 1 dB compression point and low conversion loss, the mixers feature a very wide dynamic range. Therefore, measurements of low-level signals can easily be performed even in the presence of high-level signals. The high LO frequency range and the low order of harmonics used significantly reduce the number of unwanted mixing products. In addition, the analyzer firmware provides algorithms to identify and suppress remaining unwanted mixing products. The models R&S®FS-Z75, R&S®FS-Z90 and R&S®FS-Z110 GHz have a higher IF OUT frequency range (IF OUT) of 5 MHz to 6.0 GHz that enables an analysis bandwidth of more than 5 GHz.